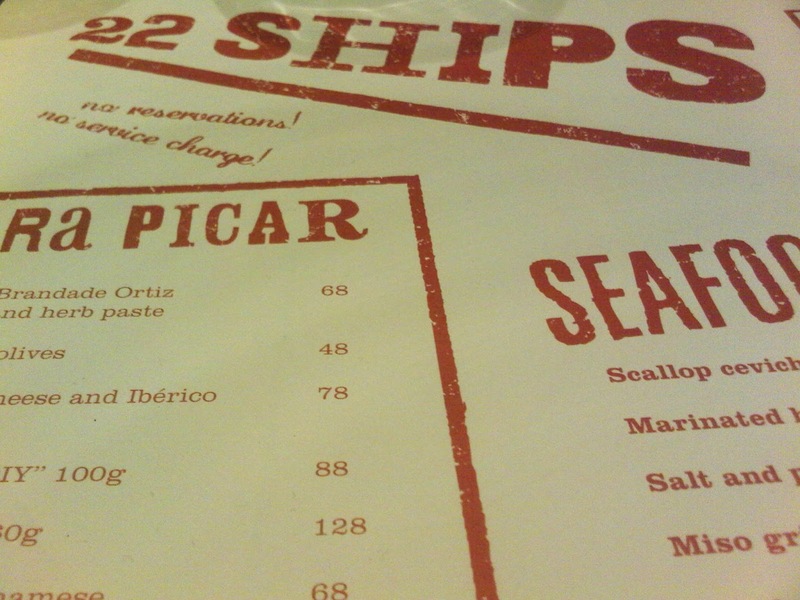 Last night I hopped on down to Ship Street in Wanchai to try out brand new Hong Kong Tapas restaurant, 22 Ships. New restaurants seem to be opening in spades in Hong Kong at the moment, but for the last few weeks Ship 22 has ranked pretty high up on my new openings radar. Brought to us by Michelin starred chef, Jason Atherton (protégé of Gordon Ramsey and El Bulli's Ferran Adrià), Ship 22 clearly has stellar cooking credentials. Buzz has steadily been building in recent weeks - interviews and articles and frenzied Twitter excitement - I knew from the moment that I saw the hoardings, that this was one to check out the second that it threw its doors open. And so last night, on the second night of the restaurant's soft opening, I was perched at the bar sipping a glass of sangria and perusing the menu while nibbling on wafer thin slices of ruby red Iberico Bellota. 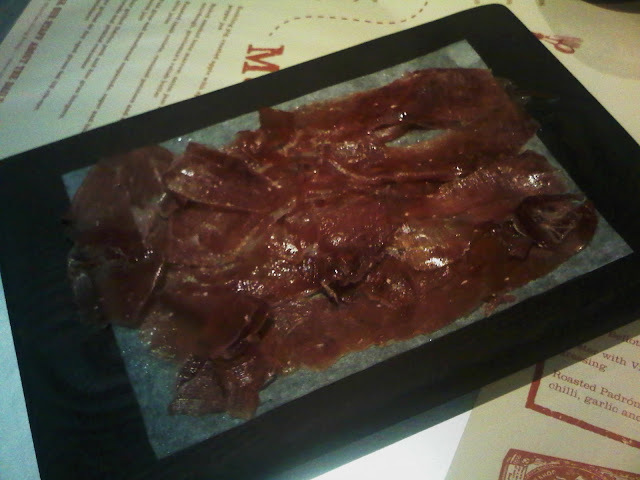 In fact that little wooden board of jamon was so incredibly delicious - meltingly tender with a rich, nutty flavour - that even if Ship 22 had been solely serving ham, I'd be writing a rave review. The restaurant is a cosy 35-seater tucked away on the strip de jour from which it takes its name, Ship Street. Whitewashed exposed brick walls are hung with framed black and white photographs and big blackboards with the day's specials chalked across them. The atmosphere is laid-back but buzzy; a neighbourhood restaurant with a bit of sparkle. Settled on high stools at the bar, we had a front row view of the blur of action in the open kitchen as the white coated army of chefs whipped up our supper. The tables by the open front seem the prime spots to bag though, ideal for spilling out onto the pavement with a group of friends while tapas grazing and working your way through a couple of bottles of wine. Unfortunately I left my camera at home so had to make do with my pathetic little Blackberry camera (roll on the arrival of my brand new iPhone), the photos below don't even vaguely do the food justice but they do at least give you the general gist. 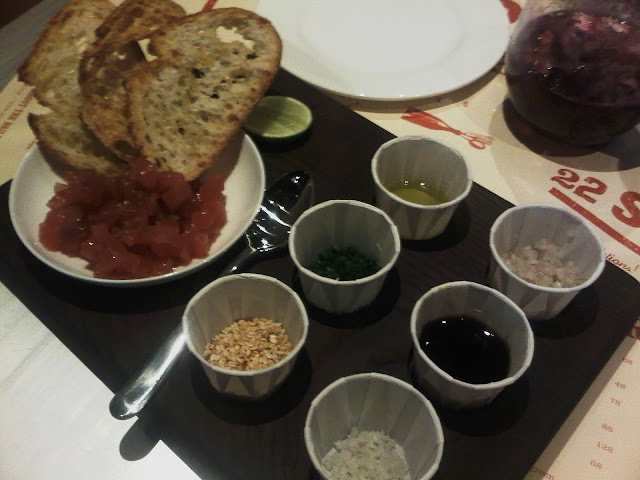 First up a couple of Para Picar, the Tuna tartar "DIY" and Salt Cod Brandade Ortiz. We loved the tuna - gleefully piling rounds of toasted bread with finely diced tuna before adding generous sprinklings of sesame seeds, chives, shallots, sea salt and olive oil. The DIY element meaning that we could customise each mouthful to our specific preferences. The brandade, a dip of salt cod, anchovies and herbs blended with olive oil wasn't quite so good - a little too overpowering and fishy - we pushed this aside after a couple of mouthfuls in a bid to save precious space for the rest of our feast... . 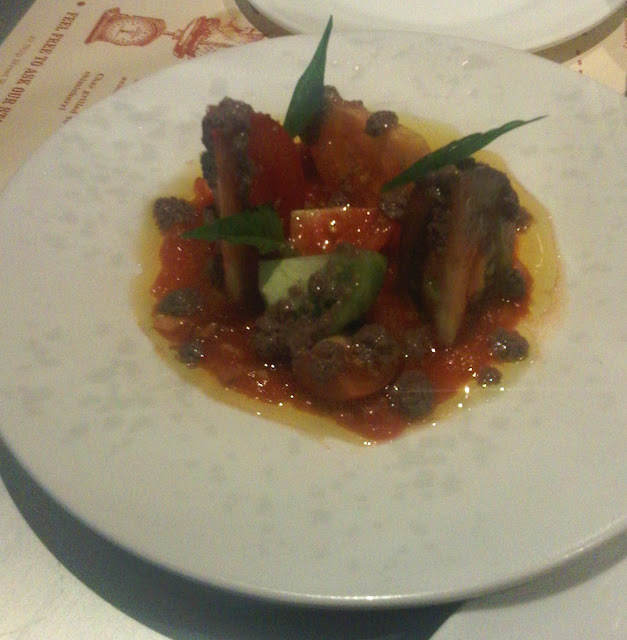 The next dish was one recommended by our waitress, the Spanish breakfast. 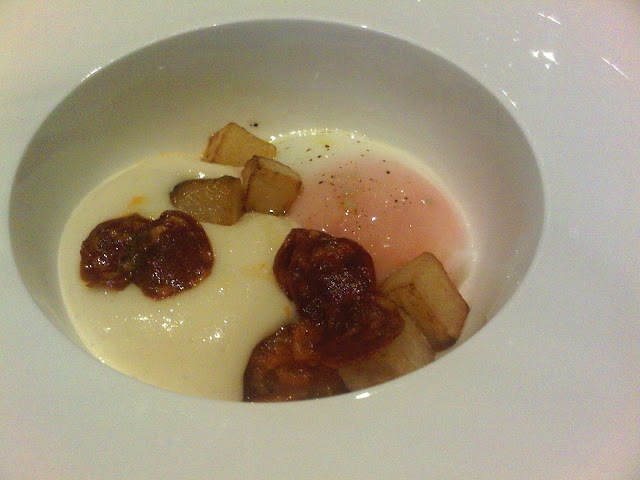 A soft boiled egg with chorizo and potato - creamy and rich with a touch of lazy, smoky spice from the chorizo. 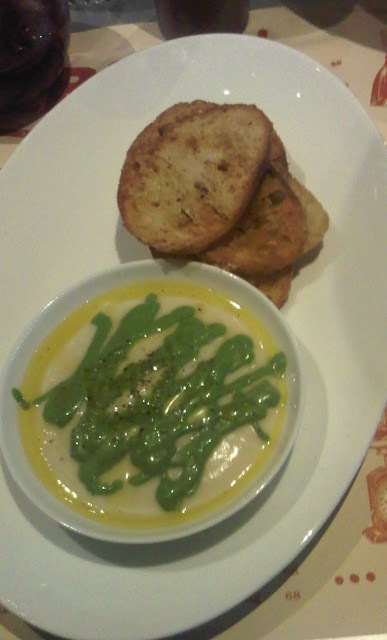 A cosseting, comforting dish - we scraped up every last morsel. The scallop ceviche with yuzu dressing, soy, cucumber and apple was the dish that I'd heard most about and its not hard to work out why. 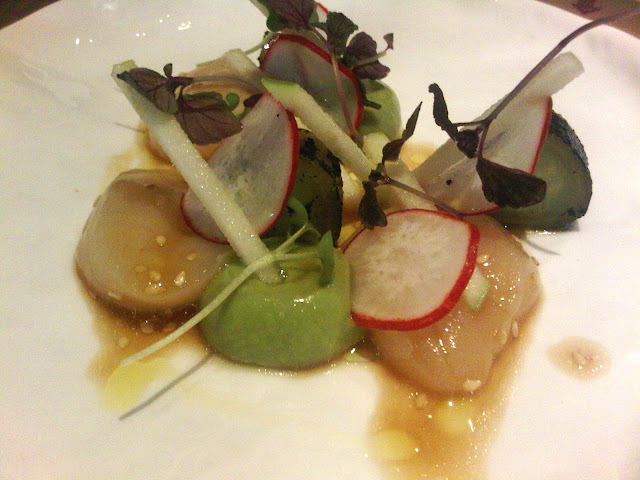 The delicate scallops given an Asian zing from the soy and yuzu and a crunchy, freshness from the radish and apple. So many flavours and textures - a total triumph. 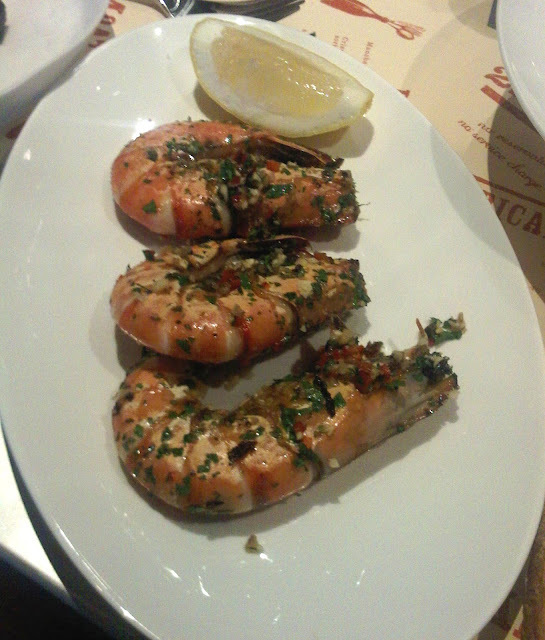 The Gambas with chilli and garlic looked incredible - three plump juicy pink king prawns, shells flecked with parsley, scarlet chili and plenty of garlic. Sadly looks outweighed flavour here. Slightly overcooked, the prawns had a bit of a wooly texture and as always with seafood cooked in the shell, all the amazing flavour from the marinade was discarded in the peeling. The solution? A good squeeze of lemon and a greedy scoop of the herby, chilli, garlicky goodness rescued from the shells. Vegetable dishes so often end up being forgettable and bland nothing more than a bit of greenery to assuage your healthy eating guilt. Not so at Ship 22. The Heirloom tomato, red onion, sherry vinegar salad was fragrant and summery - the sweet, juicy tomatoes were dressed with a light anchovy foam for a bit of punch. 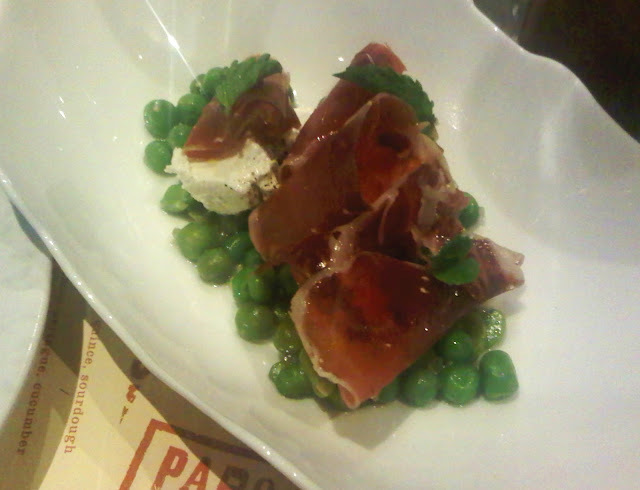 And then there were the peas, broad beans, goats curd and Iberico ham with mint dressing - one of my favourite dishes of the night. I already knew that anything featuring the ham was going to be a winner, but adding creamy mild goats cheese, sweet peas and spiking the lot with a scattering of mint and a glug of olive oil created a truly sublime salad that's definitely not to be sniffed at. By now we were pushing the realms of ridiculous food consumption, but the char grilled Iberico pork and foie gras burgers had been billed as a must-try and I never like to ignore a good food tip. 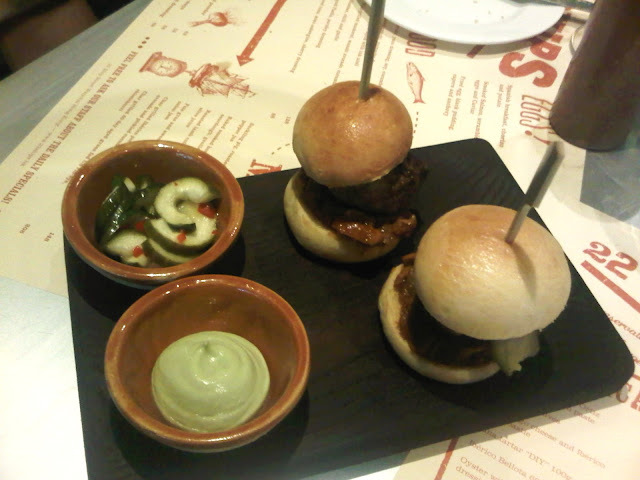 Two mini buns arrived stuffed with pork, foie gras and pickle together with a small pot of creamy avocado dip and extra pickled cucumber. The total knock-out dish of the evening. Just try them, I defy anyone not to agree that they're heaven in a bun. And while we were at it, it would have been rude to have left without sampling the steak... The char grilled, 40 day aged, grass fed US rib-eye no less. 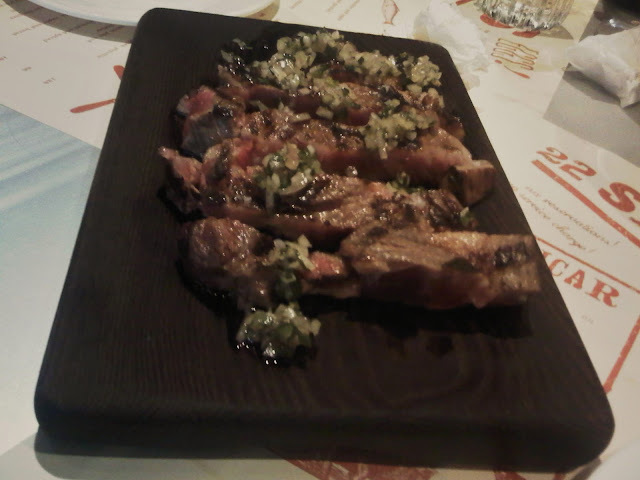 Succulent, tender slices of flavoursome meat, cooked to perfection and topped with a liberal helping of chimichurri. A carnivore's dream. We really didn't need anything else but the peanut ice-cream reeled me in and I was powerless to resist. Fresh and juicy blue fruit sorbet, just the right side of tart was the ideal plate mate to the sumptuously creamy peanut butter ice-cream. 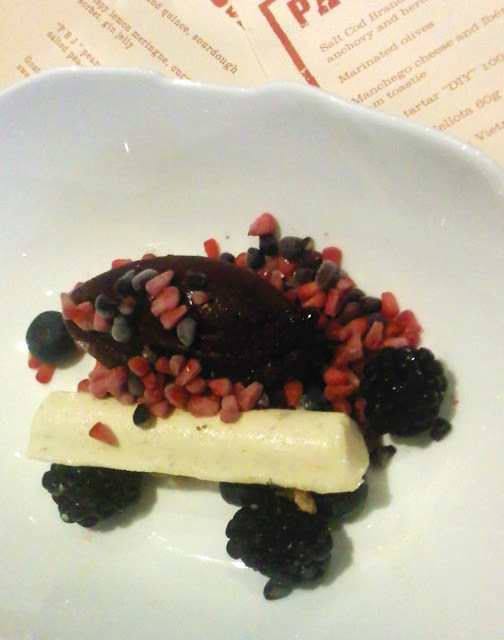 A layer of salted peanut caramel provided a bit of salty sweet crunch while individually frozen segments of raspberry and blackberry gave a jewelled finishing touch to the dish. 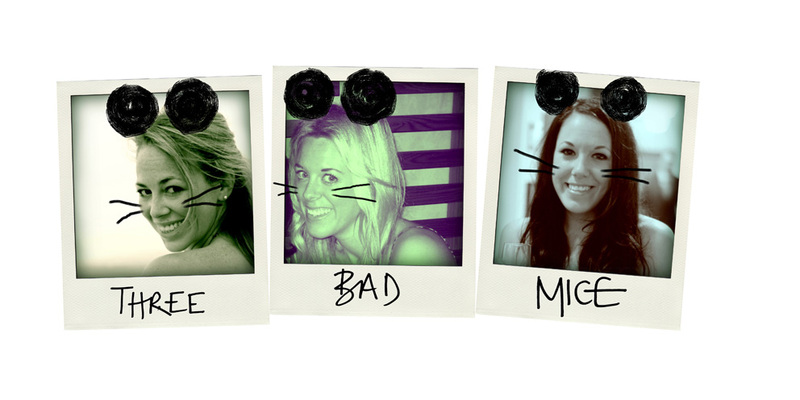 The overall verdict? An exciting new addition to the Ship Street dining scene; the hype was more than justified. Keeping in mind that this was only Ship 22's second day of service, the majority of dishes were beautifully executed and lipsmackingly delicious with a couple of stellar stand outs that alone could carry a lesser restaurant. Service was friendly and efficient and we weren't hurried or hassled despite the restaurant being packed to the rafters with queues snaking round the block. The perfect spot for a Friday night fiesta with a bunch of your best pals. Every dish looks mouth watering. I'm definitely keeping Ship 22 in mind since we're gonna travel there a week from now.